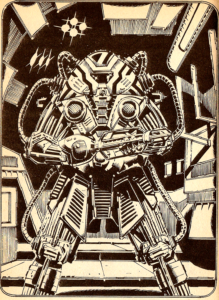 The Fighting Fantasy franchise had, uhm, mixed results when it came to science-fiction. And most of those mixtures were awful. Case in point, Space Assassin. You’re an assassin. You’re in space. Try as I might, I just find this one kinda hard to get excited about. 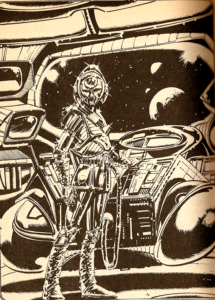 The cover is very dark, with a pair of chaps in space-type armour. The font for the title is vaguely sci-fi-ish and when I flick through the pages, I catch sight of a LOT of small artwork pieces of eyes staring out at the reader. A lot of them. It’s actually a little unsettling. I’ve a fairly decent skill roll of 10, and a stamina of 16. My armour score is a mere 7, which is basically equal to either wearing a wet paper bag or Eldar armour. I don’t think that they’re actually called Eldar any more, but I don’t really care. The game gives me the option of choosing what weapons to take with me at the start, so I stock up on three grenades and an assault rifle type of weapon. With that done, it’s time for our mission briefing. Cyrus, the evil necromancer scientist, has been sending his army of killer undead mutants to various villages planets in the area, and it’s up to me to stop him. I have to sneak into his dungeon spaceship and track him down… yeah, this is basically the same Fighting Fantasy adventure as any other. None of this is actually any different to the usual Fighting Fantasy adventure – it’s simply a standard fantasy adventure with the thinnest attempt at a sci-fi skin applied. I manage to smuggle myself into Cyrus’ giant spaceship while it is refueling, although rather than hide out in some cargo crates, my character decides to sneak through one of the external airlocks. This deposits me into a totally unknown area of the ship. I immediately find the body of a dead alien creature, which seems to be clutching a button of some sort. The item it’s holding is incomplete, and I don’t really have any clear idea what it is, so I just write ‘alien button’ on my item sheet, and head through a maintenance hatch to another part of the ship. If this were a proper space ship, you’d be able to roughly map out some kind of logic to how it is laid out – engineering and systems at the back of the vessel, medical bays near the crew quarters, helm and navigation at the front, that sort of thing. 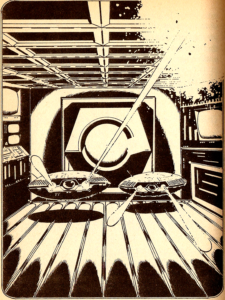 But seeing as this ship is essentially a dungeon with a lick of sci-fi paint, I’m willing that you can find rooms laid out in any order at all. For instance, the first chamber I come to is a brig. I’ve no idea why they’d build a brig so near an airlock, maybe Cyrus’ guards don’t want to have to walk too far before they chuck their prisoners out into space. Either way, I kill the robot guard and open a few of the cells. In one cell, an old wounded prisoner thanks me for saving him, and tells me to be careful if I’m dealing with the ship’s pilot. He doesn’t tell me anything useful, like “Don’t go into the next cell, because there’s a nasty little monster that will chew part of your armour off”. So I go into the next cell, and encounter a nasty little monster that chews part of my armour off. I stumble around in corridors for a while longer, and eventually bump into a pair of alien scientists. I know that they are scientists because they are described as wearing lab coats. They beg me not to kill them, and I agree. Then, for some reason, the book states that I order them to strip. I… don’t know why… and I’m not sure I want to know. I take their security keys and head into the secured area, but the game doesn’t lead me to any labs. So I’m not sure what these two scientists were doing so far from their natural habitats. Either way, I trudge through some more corridors, before coming to a small kitchen area. I have the chance to eat some energy pills (in the future, all meals come in pill-form, and all medicine pills come in a form too horrifying to imagine), but because my stamina is still high, I just head back to the main hallway. I am then confronted by a security robot which asks to see my ID. I would want to hand over the security pass keys that I have taken from the naked scientists, but the book doesn’t give me this option. Instead it asks if I want to bluff the robot. I try this, but the robot simply shoots me. Oh boy. So I shoot the robot to death, and the book asks if I want to examine its smouldering ruin. I check it out, and in the process I find a security safe which is hidden somewhere in the room. I’m not sure how searching the robot’s body lead me to what is essentially a hidden chest, but sod it. The safe has three buttons on it, and I can press either one. I am NOT given the option of leaving the damn thing alone. Why not? Hell if I know! So I press the green button, which takes me to a section that simply tells me “turn to (other section)”, which is one of my pet peeves. All this does is annoy me, because it requires you to flick from one page to yet another page with no indication as to why or for what reason. At least put SOMETHING in the text. It doesn’t matter anyway, because the stupid safe explodes in my face and kills me, so the entire thing was doomed from the moment that the book forced me to choose which button to press, even though I didn’t want to press any damn button in the first place. I don’t like this book at all. I’m tempted to give it another play-through simply so that this article is a little longer, but frankly, I just don’t care for the book and I’m quite happy to leave it as it is. So instead I’m going to talk a little about literary theory. You see, this book is essentially the same as many other Fighting Fantasy games in terms of content and storyline. The main differences are in terms of the style in which they’re presented – monsters become robots, dungeons become spaceships, and so on. This isn’t necessarily a bad thing – in fact, it can show several key points in literary theory, in particular the ideas of Vladimir Propp and Roland Barthes, who are most commonly known respectively for their Morphology of a Folktale and Death of the Author theories. In essence, this shows us that the core skeleton of the story remains the same. The only thing that is ever truly different is the additional stylistic and genre-specific signifiers that the story is dressed in. For instance, our bare-bones Fighting Fantasy story is the ‘go and kill an evil wizard who lives in a dungeon’ story. In Vault of the Vampire, we see that same story, but it is dressed in a gothic horror style, with the grandiose castle taking the place of a dungeon, and the vampire taking the part of the wizard. In House of Hell, the structure is changed from actively attempting to seek out your evil wizard to attempting to flee from him, but you still have a ‘dungeon’ to explore in the guise of the house, and the wizard is replaced by the lord of the manor. And here in Space Assassin, you have a very clear one in which a mad scientist plays the antagonist’s role. This isn’t so much down to being formulaic, all of the FF books have a certain formula to them. 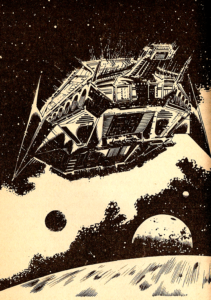 The difference between House of Hell and Space Assassin, is that House of Hell presents itself in such a strong stylistic way that you don’t notice the structure beneath it. It is aided by a very strong atmosphere which aids you in suspending your disbelief. 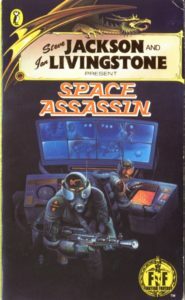 Space Assassin, sadly, does not have that sense of atmosphere. Its style is not strong, and as a result you see right through its sci-fi veneer and down to the structure underneath. So yeah, think this is one assassin I’m not going to think about hiring again. Sorry. Cause of death: Uninspired writing.